This CellML version of the model has been checked in COR and OpenCell and the model runs to replicate the results in the original published paper. The units have been checked and they are consistent. ABSTRACT: The molecular machinery of cell cycle control is known in more detail for budding yeast, Saccharomyces cerevisiae, than for any other eukaryotic organism. 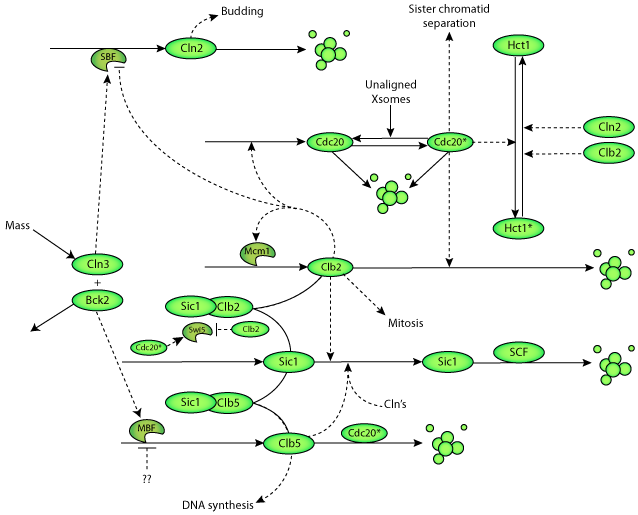 In recent years, many elegant experiments on budding yeast have dissected the roles of cyclin molecules (Cln1-3 and Clb1-6) in coordinating the events of DNA synthesis, bud emergence, spindle formation, nuclear division, and cell separation. These experimental clues suggest a mechanism for the principal molecular interactions controlling cyclin synthesis and degradation. Using standard techniques of biochemical kinetics, we convert the mechanism into a set of differential equations, which describe the time courses of three major classes of cyclin-dependent kinase activities. Model in hand, we examine the molecular events controlling "Start" (the commitment step to a new round of chromosome replication, bud formation, and mitosis) and "Finish" (the transition from metaphase to anaphase, when sister chromatids are pulled apart and the bud separates from the mother cell) in wild-type cells and 50 mutants. The model accounts for many details of the physiology, biochemistry, and genetics of cell cycle control in budding yeast. Molecular model of the control of CDK activities during the budding yeast cell cycle. Derived from workspace Chen, Csikasz-Nagy, Gyorffy, Val, Novak, Tyson, 2000 at changeset 42ecf20937b3.